Winnie the Pooh: Oh bother! Eeyore: It’s not much of a tail but I’m attached to it. Rabbit: Oh, dear. Oh, gracious. Oh. Well, it all comes from eating too much. 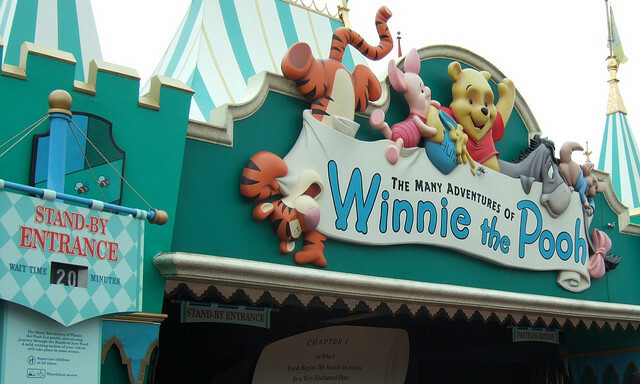 Winnie the Pooh: It all comes from not having front doors big enough! Winnie the Pooh: Oh, bother! Empty again! Only the sticky part’s left. Winnie the Pooh: [opening his door] Hello, out there! Oh, I hope nobody answers. Tigger: T-T-F-N. Ta-ta for now. Tigger: Say, who are you? Tigger: Oh, well, please, for goodness’ sakes, narrate me down from here. Eeyore: It’s snowing still…And freezing… However, [ brightening up a little] we haven’t had an earthquake lately. Rabbit: [drawing on Pooh’s backside when he’s stuck in Rabbit’s door] Oh Pooh! You messed up my moose! Christopher Robin: Pooh, promise you won’t forget me, ever? Tigger: Yuck! Tiggers Don’t like honey! Winnie the Pooh: Always watch where you are going. Otherwise, you may step on a piece of the Forest that was left out by mistake. Winnie the Pooh: Did you ever stop to think, and forget to start again? Winnie the Pooh: I am shushed! Tigger: T-I-double”guh”-errrrr, that spells Tigger! Winnie the Pooh: If ever there is tomorrow when we’re not together.. there is something you must always remember. you are braver than you believe, stronger than you seem, and smarter than you think. but the most important thing is, even if we’re apart.. i’ll always be with you. Gopher: That supercilious scoundrel confiscated my honey. Winnie the Pooh: Good-bye, Piglet. Now, is the next chapter all about me? Piglet: I don’t mind the leaves that are leaving. It’s the leaves that are coming. Winnie the Pooh: Oh, stuff and fluff. Owl: Being a screech owl, she also sang soprano in the London Opera. Piglet: That’s what I’m asking myself, where? Winnie the Pooh: And what do you think you will answer yourself? Gopher: If I was you, I’d think about ssssskedaddin’ outta here. Winnie the Pooh: Before beginning a Hunt, it is wise to ask someone what you are looking for before you begin looking for it. Winnie the Pooh: I must rescue my supper! Winnie the Pooh: Can’t we go back to page one and do it all over again?